I have a friend who informed me he doesn't like to look in the mirror. Here I thought I was the only one. We don't like our looks; what I see there doesn't look like me. How do I see myself? I can't answer that. Does knowing that “appearances can be deceiving” have anything to do with this? After all, police interrogators report looking into the eyes of psychotic killers and seeing “nothing” there. I remember when I was single, talking to a woman on the phone for at least ninety minutes. She was anxious to meet up with me, so we agreed on a place. Well, she came in, took one look at me, and left. Other women told me I've got pleasant looks. Each to her own, I guess. Hasn't changed my “lack” of self image anymore than my “lack” of faith. As a boy, I listened to Jack Benny on the radio. Eventually, when I saw him on television, his voice didn't fit his face. To this day, I break out in laughter whenever I hear of someone seeing Jesus or his mother. Where is this, on paintings? (And obviously, those who tell us Jesus was a “perfect” man haven't paid attention to their gospels.) What about body image? I'll bet there are millions of women and men dieting and exercising to achieve perfect bodies, discontent with the ones they have. The subtitle of Christopher Hitchen's book, ”god Is Not Great,” is, “How Religion Poisons Everything.” At first, you might be inclined to respond, “Nah!” to that. Religion preaches ideal futures: paradise, heaven, and even a hell ideally created for those the religious hate most. Religion is ultimate idealism, offering access to and experiences of a superior spiritual realm existing outside reality. The pursuit of those experiences poisons everything in living. Creating “ideal” societies through religious and/or political movements have resulted in the suffering and deaths of millions. Thomas More, the author of “Utopia,” tortured and burned heretics. The methodologies used to create ideal societies have originated in communism, Islamic State, Zionism, fascism, Nazism, inquisitions, and even, the overblown ideals of democracies. The ongoing wars to create ideal Christian-political or Sharia law-political states is perpetual. Idealized movements to create heavens on earth have resulted in hells on earth. And yet, humans continue to believe in ideals. Nature doesn't function that way; the natural world has no beliefs, but only effects. Via the evolutionary methods of chance and natural selection, nature uses whatever each organism, including your own body, already possesses, to adapt to its needs in an environment. Whatever works is good enough. Humans aren't content with that system when it applies to their dealings living as part of nature. But first, they have to work with nature, then they've been able to manipulate its systems. Typically, there has always been something god-like about this, leading to the tempting conceit of believing humans are exempt in profound ways from the laws of nature. Thus, they believe they will someday live forever. What's so dangerous about the “ideal” or “perfect” is that those terms are ambiguous and subjective. Every year, a magazine claims “the world's most perfect man,” yet many women would think him so-so, while others would be turned off, especially if he is found to be a misogynist. Years ago, one major magazine printed a photo composite of a woman created by combining the most beautiful features of individual women. The result was a very plain individual. It is in contrasts, and not combinations of beauty, that we truly see beauty. The beauty of a U. S. constitution lies in its ability to adapt to imperfect societies, agents, and laws which are open to unpredictable changes over time. “Good enough” works. It's healthy. 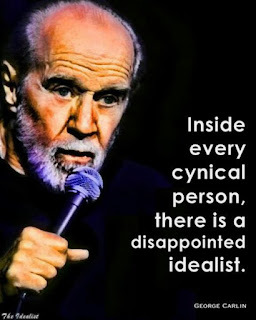 Idealism poisons.